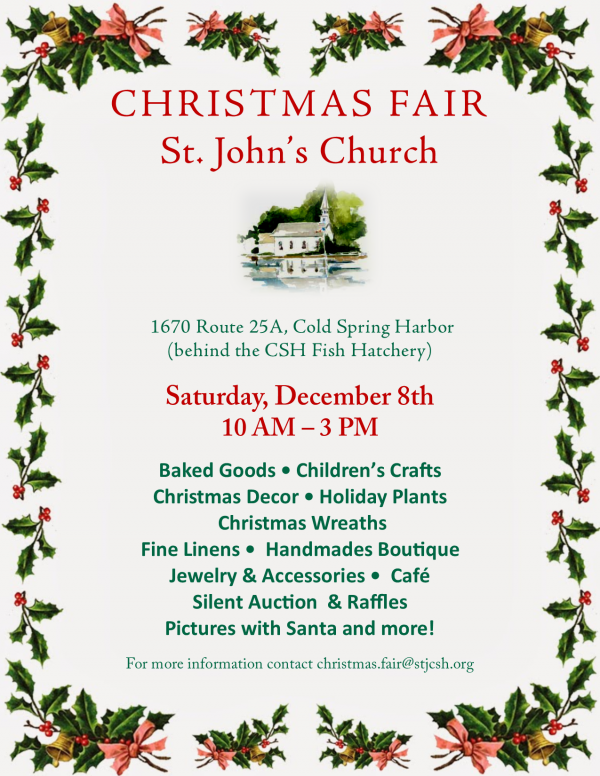 Silent Auction, Raffles, Handmade Crafts, Baked Goods, Jewelry, Christmas items, Plants, Children’s crafts and activities, our SJC Selfie Station, and a visit from Santa Claus! The café will offer lunch and snacks throughout the day. There are many opportunities for parishioners of all ages to get involved. Please join us in helping to fund Outreach while serving together and sharing a day at St. John's with the surrounding communities. Or you can contact the Fair Co-Chairs Joanna Bradford, Susan Collins, and Anna Wresch at [email protected]. Note: we are not collecting for Nearly New or Books this year - PLEASE DO NOT drop-off any donations at St. John's Church, the Rectory or any other previously designated location. Books: Anyone wishing to donate books, Michael Bonebrake, St. John's parishioner will gladly accept donations for the book tent at St. John's Lattingtown. Books in good condition, especially fiction, non fiction, decorating, gardening, history, cookbooks, travel, children’s and old books are welcomed. Donations of textbooks, reference books, College prep, medical and self help, and personal investing are discouraged. Michael can arrange pick up at your home and will provide a tax donation form. Please contact Michael Bonebrake directly.